This handbook is for social economy innovators, community builders, and sustainable developers. It helps you develop communities that demonstrate people care, planet care in a way that provides the basic needs of community members. 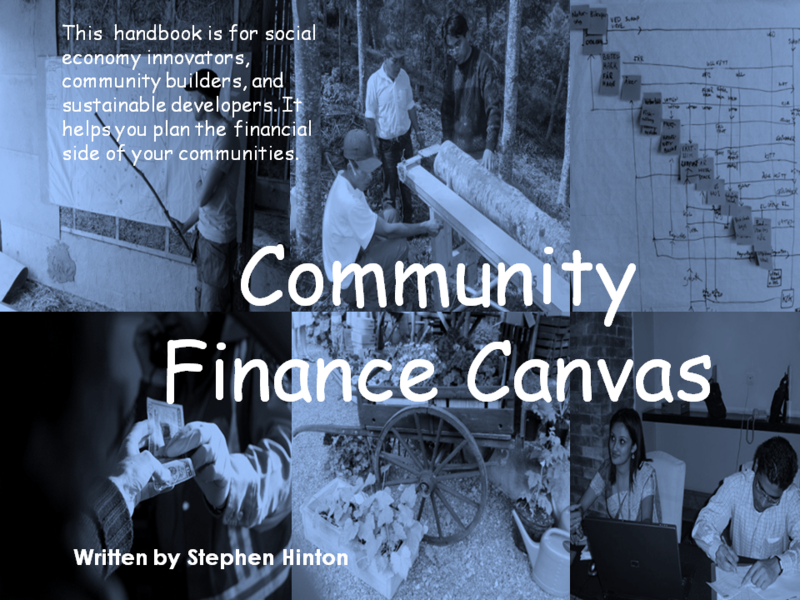 This handbook written by Stephen Hinton, acts as an introduction to thinking financially about community initiatives and covers how create a basic draft of your organisational idea, analyse capital needs and match them to people who will be in the community and those who will support it. It take you through the basics of choosing the appropriate legal structure and how to feed figures into a business plan. Use this handbook to bring your community members together to see how they can make their dreams in to reality. Still in production and slated for release in 2016, you can get sections of the book in advance by signing up for our free COMMUNITY FINANCE BRIEFINGS and get the opportunity to buy one of the first set of discounted copies. The whole methodology is being tested with various groups, as part of the training in using the canvas methodology. Learn more about this training here.